With as many smartphone choices out there on the market, it’s important to know which technical specifications each has. 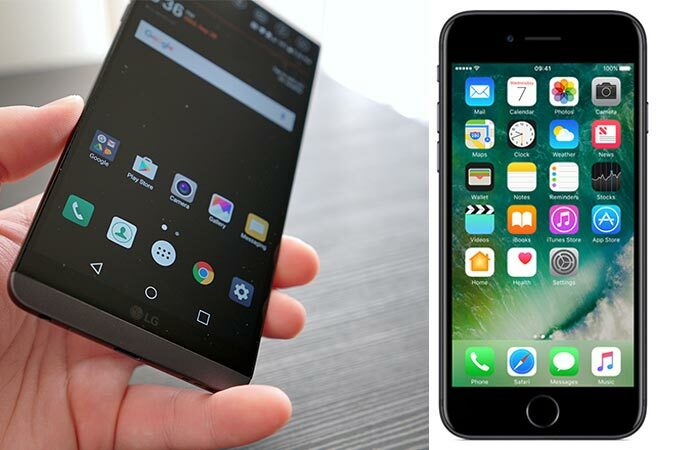 In this article, we match the LG G6 against the iPhone 7 to see which one wins in the technical department. Check out the videos below. The G6 is 8% taller, 11% thicker, and 7.5% wider than the iPhone 7. The LG G6 measures in at 5.86 x 2.83 x 0.31 inches, while the iPhone 7 only comes in at 5.43 x 2.63 x 0.27 inches. This means that the G6 is 8% taller, 11% thicker and 7.5% wider than the iPhone 7. 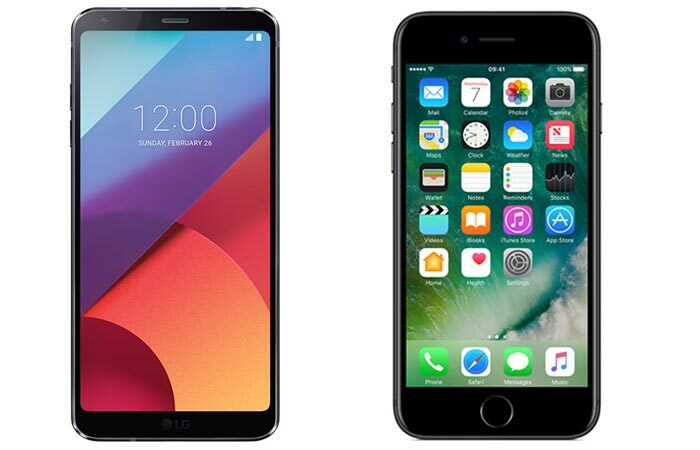 The LG G6 weighs in at 5.74 ounces, whilst the iPhone 7 weighs in lighter at 4.87 ounces. The G6 is also considerably heavier than the iPhone 7, at 18%. However, the difference in weight can be accounted for in the difference of size. The LG G6 has a glass build around an aluminum frame. The iPhone 7 has a complete aluminum unibody build. LG used a glass back constructed around an aluminum frame for its G6. However, the iPhone 7 features an aluminum unibody, making it structurally stronger. The LG G6 is available in Platinum and Black for the US, with the addition of White for international. The iPhone 7 comes in 5 different colors. As far as color options go, the iPhone wins hands down with black, jet black, gold, rose gold, and silver options. Whereas, the G6 is only available in platinum and black for the US, with white for international. The LG G6 comes with an IP68 rating, meaning that it is completely dust and waterproof. The iPhone 7 only has an IP67 rating, meaning that it is dust tight, but not waterproof and only resistant. The LG G6 comes with a complete waterproof design with an IP68 rating. However, the iPhone 7 does not lag far behind with an IP67 rating. To understand how this rating works, check out this link. 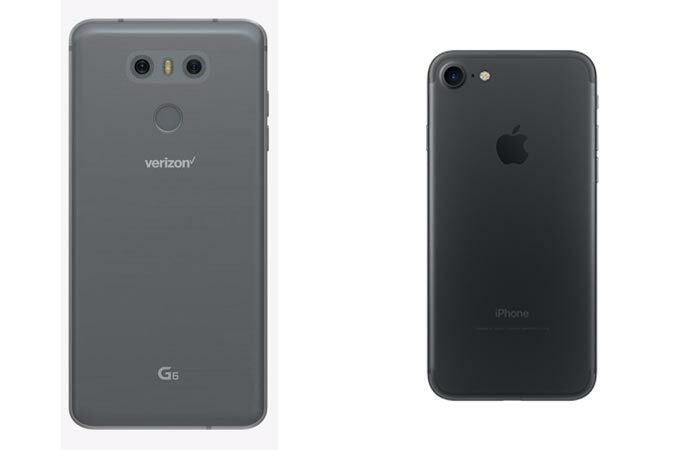 The G6 has a 5.7″ screen and the iPhone 7 only 4.7″. The G6 has a screen size of 5.7”, which would technically make it a “Phablet”. The iPhone 7 only has a screen size of 4.7”. This means that the G6 has a 38% larger screen compared to the iPhone 7. The home button of the G6 is found on the screen, and the iPhone 7 is below the screen. The G6 has the interesting feature of actually having no home button that is apart from the screen. The iPhone 7’s is located on the usual space at the bottom. The G6 has a ppi of 564 which is much better than the iPhone’s ppi of 326. To be honest, we are quite impressed with the LG G6’s screen resolution for a 5.7” screen. It comes out with a native resolution of 2880 x 1440 pixels with a pixel-per-inch (ppi) of 564. The iPhone 7, on the other hand, falls slightly short at only 1334 x 750 pixels with a ppi 326. Both devices come with an HD IPS Retina screen. Both of these phones come with an IPS screen, as opposed to an AMOLED screen. The G6 has a 3,300mAh battery, and the iPhone falls short at 1,960mAh. We all know that battery life is of the utmost importance, and, usually, the larger the battery, the longer the lifespan. However, there are numerous factors that contribute to the lifespan of a battery. The G6 does win in this department though, with a 3,300mAh battery. Where the iPhone 7 only has a 1,960mAh battery. If you need fast charging, the G6 is the way to go. The iPhone 7 does not come with this feature. As with most Android devices, the G6 does come with fast-charging. Interestingly enough, Apple has yet to adopt this feature, and it isn’t found in the iPhone 7. These devices have similar camera resolutions, but there are many factors that go into photo quality. The LG G6 has a 13-megapixel rear camera and a 5-megapixel front camera, but the iPhone 7 features a 12-megapixel rear camera with a 7-megapixel front camera. However, there are many factors that go into actual photo quality that is not determined by megapixel resolution after a certain threshold. Both devices have a camera aperture of ƒ/1.8. The Rear Camera Aperture gives us a bit more insight into photo quality, and it also determines the quality of low-lit shots. Both the G6 and the iPhone 7 has an aperture rating of ƒ/1.8. Both devices come with integrated Optical Image Stabilization (OIS). Both of these phones also comes with OIS (Optical Image Stabilization) included, which allows for much greater clarity and reduced shakiness when taking photos. The LG G6 comes with dual camera lenses, which is not found on the iPhone 7. Interestingly enough, the G6 comes with two rear camera lenses. This allows you to quickly toggle between normal and wide-angle shots. However, the iPhone 7 does not have this feature, but the 7 Plus does. 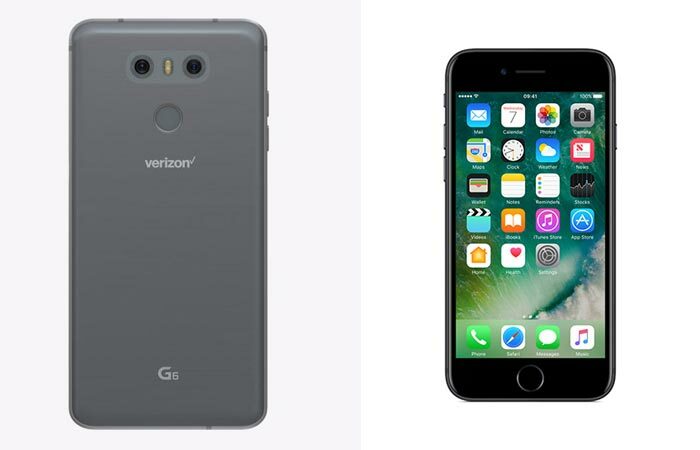 The LG G6 is limited to 32GB, but the iPhone 7 is available in 32GB, 128GB, and 256GB models. The LG G6 features 32GB of on-board memory. The iPhone 7 comes with 32GB, 128GB and 256GB on-board memory options. The iPhone is not compatible with expandable memory. The LG G6 can accept microSD. Even though it does not come with a huge on-board memory, the G6 does allow you to extend that memory with a microSD card. However, the iPhone 7 does not allow for memory extension. As with most top-range Android devices, the G6 has a SnapDragon processor. This is compared with Apple’s A10. The G6 utilizes the Qualcomm Snapdragon 821 that features a Quad Core design at a frequency of 2.35GHz. The iPhone 7 uses Apple’s A10 Quad Core that runs slightly lower at 2.3GHz. The iPhone 7 has half the RAM of the G6 at 2GB. The G6 has double the RAM that the iPhone 7 has. Running at 4GB and 2GB respectively. The G6 has a fingerprint reader on the rear of the phone, while the iPhone’s can be found in the home button. Both the G6 and the iPhone 7 come with fingerprint sensors. However, the G6 sits on the back of the device, while the iPhone 7’s can be found in the home button. The G6 still retains a headphone jack. The iPhone does not. We have all heard the moans and groans when the iPhone 7 was released without a headphone jack. It was preposterous, to say the least. The G6 has outdone the 7 in this one and still comes with the much-loved headphone jack. Both devices are equipped with NFC. Both devices support NFC (Near-Field Communication) payments. The G6 through Android Pay and iPhone through Apple Pay. The LG runs Android Nougat, and the iPhone 7 iOS 10. 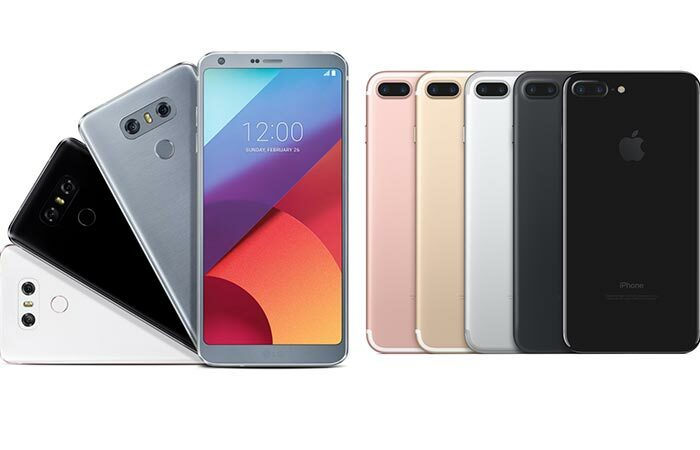 The LG G6 comes with the latest Android Nougat, while the iPhone 7 comes with iOS 10. 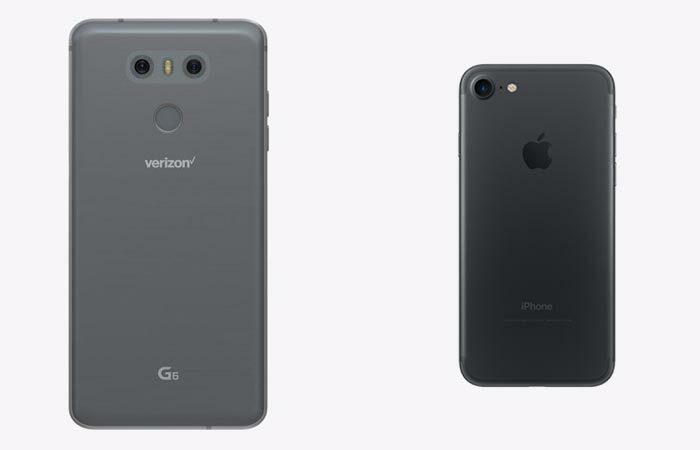 The iPhone 7 was released in September 2016, but the LG G6 can be found online as of today. The iPhone 7 was released in September 2016, whereas the LG G6 will be released in South Korea this month, and internationally in April. The LG G6 retails for $899. The iPhone 7, on the other hand, is available from $649. Get the LG G6 from Amazon here. Get the iPhone 7 128GB from Amazon here.